Use this vanity to bring more modern style into your bathroom. Its white artificial stone counter and grey solid wood base will look beautiful in your home. Add a classic feel to your bathroom with this simple vanity set from Wyndham Collection. This vanity has both an all-around look and a modern style. Its white artificial stone counter and grey solid wood base will look beautiful in your home. This classic set from Wyndham Collection will make your bathroom look brand new. Designed with a modern style and strong build, this vanity is a perfect choice for any bathroom. Its white artificial stone counter and grey solid wood base will look beautiful in your home. Put a classic feel in your bathroom with this good-looking set from Wyndham Collection. Centra 80-Inch Double Vanity in Grey Oak Simplicity and elegance combine in the perfect lines of the Centra vanity by the Wyndham Collection<sup></sup>. If cutting-edge contemporary design is your style then the Centra vanity is for you - modern, chic and built to last a lifetime. Featuring soft close door hinges, drawer glides, and meticulously finished with brushed chrome hardware. The attention to detail on this beautiful vanity is second to none. Available in several sizes and colors. 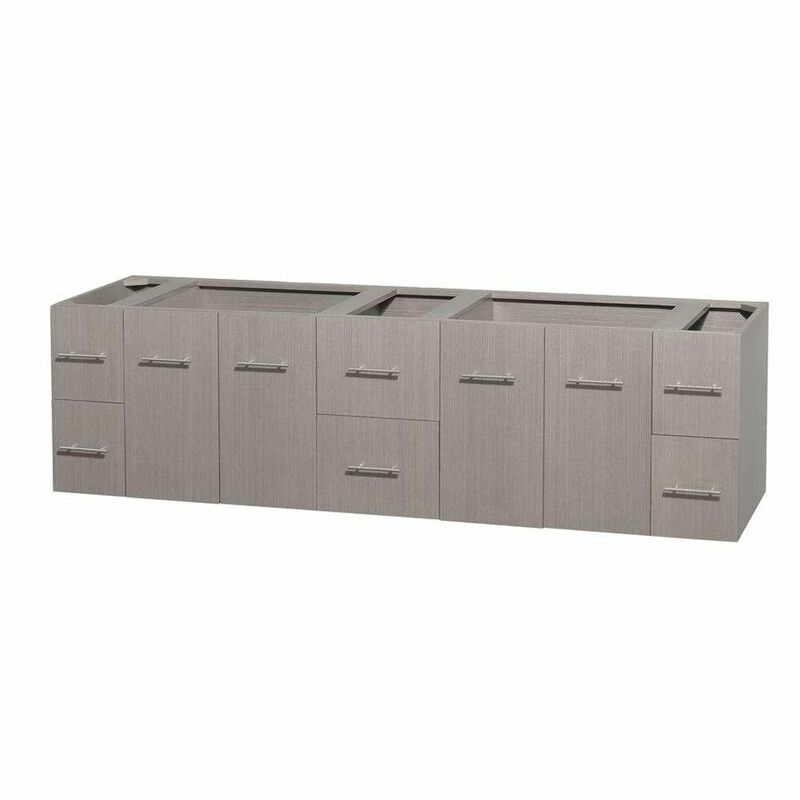 Centra 80-Inch Double Vanity in Grey Oak is rated 3.0 out of 5 by 1. Rated 3 out of 5 by Dan from It's OK - solid construction overall. Side drawers are much more narrow than they appear. Color... It's OK - solid construction overall. Side drawers are much more narrow than they appear. Color is not really gray as in the picture - a bit mauve actually. Screws that come with the product were very inferior quality - all snapped.